Many products and materials commonly found in and around the house are poisonous. Medicines account for 67% of poisonings, and chemicals 28%. Chemicals are not just used in manufacturing and heavy industry, they are a part of everyday life. Products we use to clean kitchens and bathrooms, wash clothes and dishes, kill pests and fertilize gardens are chemicals. Paints car and furniture polishes, swimming pool chlorine, petrol, engine oil, brake fluid and LPG are chemicals. soaps, shampoo, deodorants and perfumes, medicines, cough syrups and prescription drugs, vitamins, herbal medicines and organic cleaning products. It's vital to correctly store and use all chemicals appropriately as per instructions. Chemicals may be toxic, flammable or may react violently when mixed. Choose the least dangerous product that will do the job, especially if children are present. Lock chemicals in a cabinet out of the reach of children. Where possible, store liquid chemicals below dry chemicals. Remember children are curious, inventive and good climbers. Follow the manufacturer’s instructions. Handle with extreme caution. Use recommended protective equipment: gloves, safety goggles, etc. Ensure adequate ventilation. Wash cleaning rags after use, and before throwing in the rubbish. Seal chemicals in their original containers. Do not reuse empty containers or repack product in different containers. Remember some medicines look like soft drinks or lollies. Lock them away from children. Do not prepare more chemical than you need for the job. Do not use chemicals for jobs for which they are not intended. Do not pour chemicals down the drain, the toilet or the gutter. Have you inspected your chemical storage areas and container seals recently? Follow first-aid instructions. If skin or eyes are burnt, if chemical has been swallowed or fumes inhaled - call your doctor, local hospital or an ambulance. 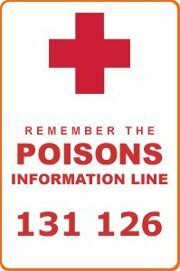 Remember the Poisons Information Line: 131 126. NSW Fire Brigades Community Risk Management. Revised 13 July 2007.